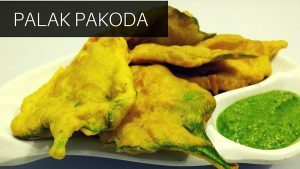 Crispy Aloo Pakora is one of the favourite street food snacks in Mumbai. Also known as Batata Bhajia or Potato Fritters – crisp and golden batter coated potato slices are deep fried in oil. This Aloo Pakodas are the perfect snack during monsoon season. Remove the skin of Potato and slice using a slicer to get the similar thickness. Keep Potato slices in a bowl filled with fresh water. In a bowl, add Besan & Rice Flour. Add all spices – Red Chilli Powder, Turmeric Powder, Carom Seeds, Soda, Powder Sugar and Salt. Add water as required and prepare the smooth batter. I have added 3/4th cup water in 1 cup Besan. Heat Oil in a Kadai over medium flame. Dip Potato slice in the batter one at a time, coat well and add in hot Oil. Deep fry until they turn crisp and golden brown. Remove on a paper napkin lined plate. 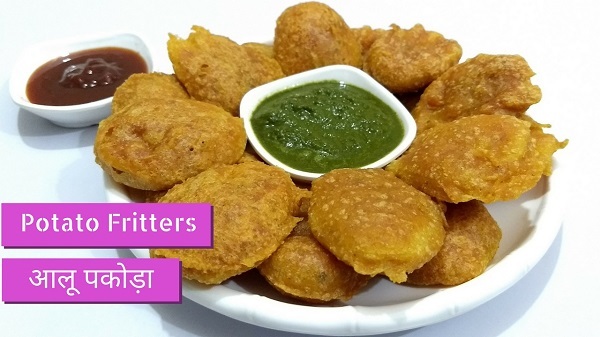 Serve hot Potato Fritters with Green Chutney or Sauce.